The National Defence Force (French: Force de defense nationale, or FDN) is the state military organisation responsible for the defence of Burundi. A general staff (État-Major Général) commands the armed forces, consisting of a joint staff (État-Major inter-armes); a training staff (État-Major de la Formation), and a logistics staff (État-Major de la Logistique). Naval and aviation commands exist, as well as specialised units. Burundi became independent in July 1962. A coup attempt in October 1965 led by the Hutu-dominated police was carried out but failed. The Tutsi dominated army, then led by Tutsi officer Captain Michel Micombero purged Hutu from their ranks and carried out reprisal attacks which ultimately claimed the lives of up to 5,000 people in a predecessor to Burundian genocides. Micombero then became Prime Minister. King Mwambutsa IV, who had fled the country during the October 1965 coup attempt, was deposed by a coup in July 1966 and his teenage son, Crown Prince Charles Ndizeye, claimed the throne as King Ntare V. Later that same year, Prime Minister, then-Captain, Michel Micombero, carried out another coup in November 1966, this time deposing Ntare, abolishing the monarchy and declaring the nation a republic. His one-party government was effectively a military dictatorship. As president, Micombero became an advocate of African socialism and received support from China. He imposed a staunch regime of law and order and sharply repressed Hutu militarism. After Micombero's coup d’etat which deposed the monarchy, he became first general in Burundian history. He was also commissioned by the National Council of the Revolution (French: Conseil National de la Révolution (CNR)), and made a Lieutenant Général. In his turn, Micombero raised Thomas Ndabemeye to the grade of Major General. They were the sole generals of the First Republic. In 1981–82 the IISS estimated that the Burundian armed forces were 6,000 strong, with 2 infantry battalions, 1 airborne battalion, 1 commando battalion, and an armoured car company. The same estimate was repeated in the 1988–89 edition except that the strength figure had been dropped to 5,500. The Burundian Civil War lasted from 1993 to 2005, and an estimated 300,000 people were killed. The Arusha Accords ended 12 years of war and stopped decades of ethnic killings. The 2005 constitution provided guaranteed representation for both Hutu and Tutsi, and 2005 parliamentary elections that led to Pierre Nkurunziza, from the Hutu FDD, becoming President. According to a 2004 report by Child Soldiers International, Burundi's military used conscripted child soldiers. Children in military service were subject to military courts which fell short of international law standards. The armed forces have deployed significant numbers of troops to the African Union Mission in Somalia since c. 2007. On February 1, 2007 Burundi committed to the mission, pledging up to 1,000 troops. By March 27, it was confirmed that 1700 Burundian troops would be sent to Somalia. In 2011 the IISS estimated that three Burundian battalions were deployed there. The army's forces in 2011 included, according to IISS estimates, 2 light armoured battalions (squadrons), seven infantry battalions and independent companies; and artillery, engineer, and air defence battalions (SA-7 'Grail' man-portable SAMs and 14.5mm, 23mm and 37mm guns were reported). Separately reported were the 22nd commando battalion (Gitega) and 124th commando battalion Bujumbura). In the wake of the Burundian unrest, personnel faced a choice between supporting President Pierre Nkurunziza, with whom some fought when he was a military commander, or opposing him. Interviewed by Reuters on May 14, 2015, an Africa analyst at Verisk Maplecroft said moves by Major General Godefroid Niyombare, former director of the intelligence service, "starkly highlight[ed] Nkurunziza’s lack of unified support among his military chiefs," he said. "Even if Niyombare’s attempt fails, Nkurunziza’s political credibility may be damaged irreparably." In the aftermath of the coup and the later disputed election, armed forces chief of staff Major General Prime Niyongabo survived an assassination attempt on September 11, 2015. 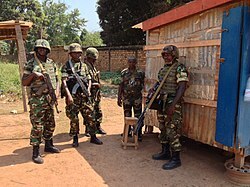 Burundi troops of the Central African Multinational Force in the Central African Republic. The Burundi Army's air unit operates 11 aircraft, including one combat aircraft and six helicopters, of which two are non-operational as of 2012. ^ "LOI N° 1/019 DU 31 DECEMBRE 2004 Portant Creation, Organisation, MISSIONS, COMPOSITION ET FONCTIONNEMENT DE LA FORCE DE DEFENSE NATIONALE" (PDF). Grandslacs.net. Retrieved 23 October 2014. ^ "Timeline: Burundi". BBC News. 25 February 2010. Retrieved 27 April 2010. ^ Background Note: Burundi. United States Department of State. February 2008. Retrieved on 28 June 2008. ^ "Burundi joins Somalia peace force". BBC. 2007-02-01. Archived from the original on 10 February 2007. Retrieved 2007-02-09. ^ "Burundi troops ready to join Somalia peacekeepers". Reuters. 2007-03-27. Archived from the original on 1 April 2007. Retrieved 2007-04-02. ^ "Army rifts could push Burundi back to conflict after coup bid". ^ "Kateholt.com : Galleries". Kateholt.com. Archived from the original on 14 April 2015. Retrieved 23 October 2014.
International Institute for Strategic Studies (IISS) (2012). The Military Balance 2012. London: IISS. ISSN 0459-7222.